I returned about a month ago to the digital domain, but in truth I am an ambivalent blogger, a teetering twitterer. I have started and stopped a number of blogs and social media accounts, preferring the pen and typewriter, real faces and real books, all the static, tactile pleasures of print. And yet here I am again on this sort of e-vanity press, this time, I think, with a more balanced and resigned equanimity, a commitment to speaking out in this limited way. A commitment, first, to a journalistic sort of activism which the rapid-fire medium of the online world is particularly good at, and, second, to the writing and publishing of work that, for various reasons, would not likely appear in any printed publication. Many print publications now demand or prefer digital submissions, and those that claim that they accept both digital and print– I wonder, when I mail my submission with a U.S. postage stamp, whether the envelope will ever be opened, will ever even be noticed. An editor once told me, when I asked if I could send a typed manuscript, that if I did so he would then have to find someone in the office to type it again into the computer. Typists are obsolete. At least we still have editors, some of whom only accept typed manuscripts, but these tend to be academic, literary types, publishers of poetry and essays. So more and more these days the choice for a writer with journalistic ambitions is between the computer and silence, and while silence or writing for personal satisfaction alone has its rewards, speaking one’s mind to the minds of others, however few, is also a good and useful activity. 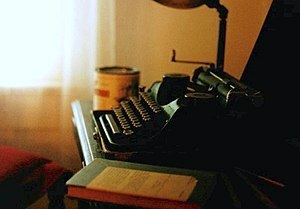 Now I try to limit my blogging and tweeting to the afternoon or evening hours, preserving the fresh light of morning for less social forms of media– notebooks, my electric typewriter, or typing something on or into the computer. I sometimes fail at this, usually because something I read in the newspaper that morning gets me worked up and wanting to immediately enter the partisan fray. Some bloggers and tweeters, it seems, never sleep, never take their eyes or hands off their digital devices; they seem to be on permanent digital vigilance, opting for quantity rather than quality, hyper-linked to the entire world, competing for attention with pure volume. I admire their stamina, but breakneck blogging is not for me. I value my solitary disconnection too much, am too much a man of the papered, patient past to abandon myself entirely to the convenient speed of light. We used to say, in a slower time, that “speed kills” and we drove at 55 miles per hour. I think there is a speed of communication above which it is not safe or even necessary to go. Slow thought, like slow food, is ultimately more healthy. If anything, I want my habit of print to rub off on my time online. I don’t just want to fill up; I want to dine.